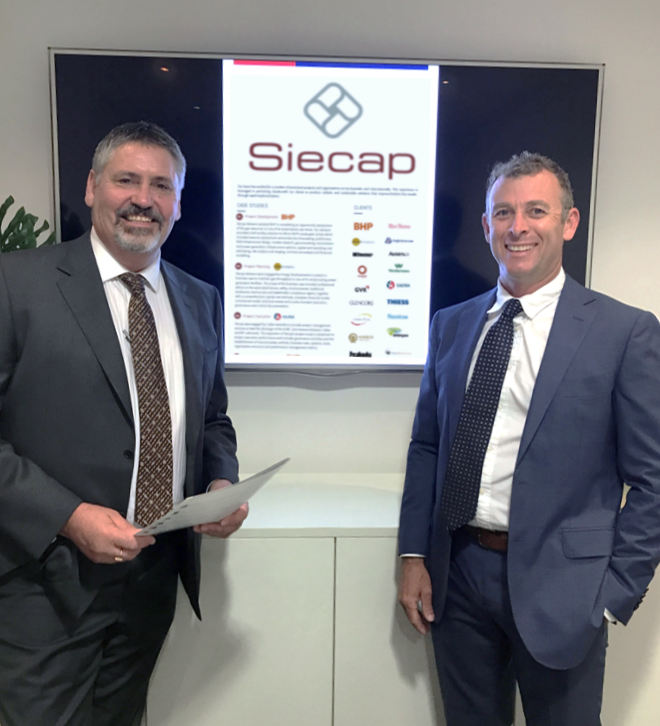 Leading Brisbane project management and advisory firm Siecap has expanded its consulting services into the traditional and renewables energy sector, building upon recent successes in delivering energy studies for its clients. Siecap’s energy division welcomes John Henderson and Matt Cooper, who are both trusted industry executives with a reputation for integrity and performance. John Henderson brings over thirty-five years’ experience to Siecap’s Advisory Board, that encompasses developing and executing complex mining and energy projects in Australia, Africa and Asia. His broad knowledge across mining and energy portfolios reinforces Siecap’s practical and customer-focused project delivery base and lends support to the company’s impressive history of delivering value to its clients. Joining Siecap as Executive Director – Energy, Matt Cooper has 25 years’ experience in the engineering sector which includes over 15 years’ experience developing and operating oil & gas, mining and energy resource tenements and associated infrastructure. Like John, Matt brings a unique mix of cradle-to grave experience that has evolved from engineering trade qualifications through to engineering and masters commerce degrees. This enables them to bring a dynamic blend of practicality, enthusiasm, technical aptitude and commercial acumen to the development execution and operation of complex energy and natural resource projects. Matt has an impressive track record of successfully developing and operating multiple simultaneous energy & resource industry work programs. His point of specialization is that he is one of few industry professionals spanning both the resource and infrastructure aspects of the full project lifecycle from project development through to execution and operation. Siecap Chief Executive Officer, David Irvine believes that with the combined experience and talent both John and Matt bring and with the recent successful delivery of project studies in the energy sector, the Siecap energy business has the potential to grow into a powerhouse business unit within the Siecap portfolio with a professional service offering that can benefit its existing and future clients. “Since 2007, Siecap has built an impressive reputation for delivering substantial value to its clients and we see the energy and resources portfolios as strategic areas that complement our existing business skillset. This affords us the ability to identify, assess and implement energy projects that can improve our clients’ bottom line,” says David. “Matt brings an extensive network and a wide spectrum of skills to our business and John enjoys both the strategic and operational aspects of energy studies and projects,” he says. Siecap Energy has recently delivered a gas resource commercialization strategic overview for a major client and is currently undertaking an appraisal study for a client seeking to vertically integrate upstream from its power generation assets, a strategic re-alignment for a pipeline operating company and a project focused on optimising the safe and efficient drainage and commercialisation of gas from an underground coal mine. Siecap is a dynamic project management and advisory business that provides customised solutions across the energy resources, infrastructure, agribusiness, supply chain, logistics and procurement industries that balance leading edge strategy with pragmatism.